The Turkish Cypriots live on the northern section of the island of Cyprus, located in the Mediterranean Sea, just south of Turkey. As the descendants of Turkish Ottoman invaders who conquered Cyprus in the 16th century, the Turkish Cypriot proudly maintain Turkish customs, traditions, and language (Turkish). Today, the Turkish Cypriots make up about one-fifth of the island's total population. Various estimates point out that at least half of the Turks in Northern Cyprus are settlers from Turkey who emigrated in the last 30 or 40 years. The Greeks, who inhabit the remainder of the island, have been enemies of the Turks since the Ottoman invasion. Cyprus became an independent republic in 1960, a move that was supposed to end warfare between the Greeks and the Turks. However, the bitterness continued, and when war erupted again in 1963, the Greeks won economic control of the island. Turkey invaded in 1974 and took control of the northern third of the island. Today, a border separates the two peoples, whose animosity has never allowed them to come to terms with one another. Most of the Turkish Cypriots live in rural villages and rely on agriculture and trade for their livelihood. The land primarily consists of fertile plains, the inhabitants of which are blessed with a favorable climate that nourishes lush vegetation. Crops include fruits, wheat, barley, carrots and other vegetables, tobacco, and green fodder. Men handle most of the agricultural chores, but during harvest time the whole family helps with the farming duties. Those who prefer an urban lifestyle can find homes and plentiful jobs in the towns. The homes in Cyprus are typically made of wood or stone. They usually have two stories and flat roofs. Animals share the lower floor along with storage facilities. In single story houses, the women use the living room to work in during the day; at night it becomes the family's bedroom. Cyprus's excellent educational system provides free elementary education, for at least three of the five-year secondary education program, and technical training. As a result, there is very little illiteracy on the island. There are actually six universities in North Cyprus where Turkish Cypriots reside. These universities bring in people from all over the Muslim world. As a result of these universities and other factors younger generations are speaking English more and more. English is spoken widely as a second language, and many older Cypriot Turks know Greek. Thanks to the healthy climate and well-organized health services, the people are generally healthy and the island, as a whole, is free of major diseases such as malaria and tapeworm cysts. Craftsmen skilled in calligraphy, ceramics, and metalwork help keep the Turkish culture alive in Cyprus. Rug weaving is also an important skill because rugs are part of the Islam prayer ritual. Girls and young women are responsible for weaving the beautiful rugs. Marriage is important in a Muslim culture and Turkish Cypriot girls usually marry at a young age. Marriages are usually between close kin, even between first cousins. Such intermarriage is common in a Muslim culture because it helps keep wealth within the extended family. 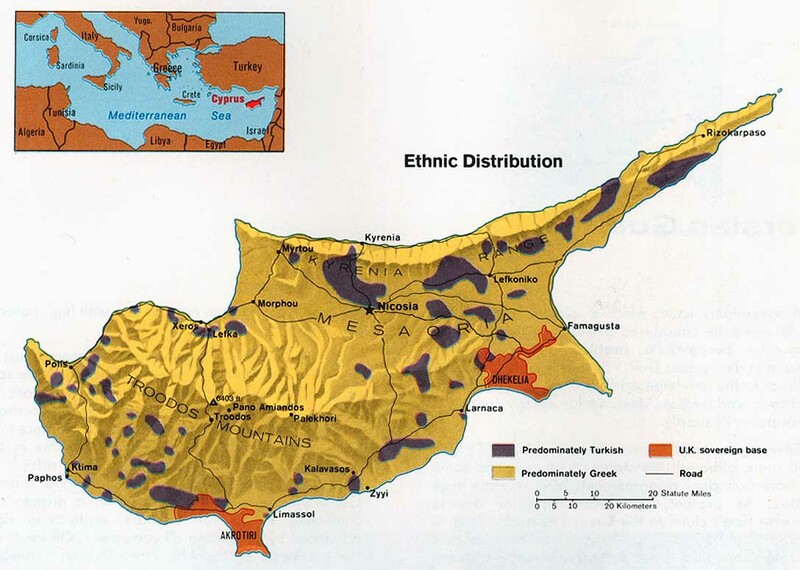 The Turkish Cypriots are Caucasians; most have dark hair and brown eyes. They are known to be gentle, courteous, and hospitable to strangers. They are proud of their ethnic heritage and remain very loyal to Turkey. Almost all of the Turkish Cypriots are Muslims who practice Muslim ceremonies and follow Islamic beliefs. For example, they believe that death is the beginning of a new life; the dead person waits for resurrection to either heaven or hell, depending on the way he/she lived life on earth. They believe in the "evil eye," which is the power to harm someone just by looking at him. An extremely small number of the Turkish Cypriots are Christians. The Bible, Christian radio broadcasts, and the Jesus film are all available in the Turkish language. Strongly devoted to Islam, the Turkish Cypriots need much prayer and dedicated workers living among them so they will know that when they die, it is not how they live, but Who lives inside of them, that will bring them to heaven. * Scripture Prayers for the Cypriots, Turkish in Cyprus. * Ask the Lord of the harvest to send forth laborers to live and work among the Turkish Cypriots. * Pray that God will raise prayer teams to break up the spiritual soil of Cyprus through worship and intercession. * Pray for effectiveness of the Jesus film among the Turkish Cypriots. * Ask God to anoint the Gospel as it goes forth via radio to the Turkish Cypriots. * Ask God to strengthen, encourage, and protect the small number of Turkish Cypriot Christians. * Ask the Lord to bring forth a triumphant Turkish Cypriot church for the glory of His name!